Back when I was desperately trying to address my own severe case of PCOS, I spent thousands of dollars on an array of products. I tried chlorella supplements, I tried a candida eliminator, I even tried drinking a juice made of carrots and greens every morning that looked just like pond scum and turned my skin orange! So yes, I really mean it when I say I tried everything. I didn’t know it at the time, but the real reason nothing worked was that I wasn’t using supplements correctly. You can’t simply slap a pill or potion on hormonal imbalance and expect it to magically heal the condition. Supplements can and do support major healing, but they have to be used synergistically, meaning the correct formulations must be used in conjunction with the correct diet. Biohacking is simply the modification of micronutrients, diet and lifestyle to optimize the functions of the body’s biological processes. For women, this means replenishing micronutrient levels and cycle-syncing diet and lifestyle. And yes, I wrote the book on that. The key difference between biohacking for men and biohacking for women, is that in the case of men, they are trying to maximize energy, concentration, and stamina during their very short 24 hour circadian hormonal pattern. For you, as a woman, you are already maximally efficient by design, so you simply need to nurture your cyclical patterns and endocrine system’s nutritional needs, and you will feel the benefits quickly. This means you can biohack your way to an easy, symptom free period in a very short time! The biggest learning that came out of my years-long supplement experimentation was that the proper products are meant to work in harmony with hormone-healthy foods. Sure, any manufacturer can sell a product that says it “blocks estrogen,” but if you ingest that product (assuming it actually does what it says it does — many don’t) and you’re not taking in other important micronutrients, all you’re really doing is investing your money into making really expensive pee. Seriously! That’s what I was doing for years, and along with overpriced urine, the misguided expectations created a lot of frustration and hopelessness. I don’t want you to needlessly suffer the same defeating feelings. I’ve seen so many women throw their money away on useless supplements, only to realize the products aren’t working, which leads them to stop trying to heal altogether. I don’t want you to give up — you can change your hormonal situation. You just have to do it the right way. That’s really why I created this kit. The five essential formulations must be used together because that’s exactly how they should fit into your life; as a supportive, synergistic team. These micronutrients are the ones I’ve relied on for the past 17 years to not only put my serious hormonal dysfunction into remission, but also help maintain my endocrine and overall health over time. These are my go-tos, and they’re exactly what I know will help support you as you take control of your own health and transform your life. When it came time to manufacture my kit of essential supplements, I created the five formulations that are truly non-negotiable: B-complex, magnesium, liver detoxifier/estrogen metabolizer, a probiotic, and a D3-omega-3, K blend. One question many clients have is whether or not they need to take a multivitamin, and as you may have noticed, I didn’t include one in my kit. The reasons are simple: most multivitamins contain too much of the wrong nutrients and not nearly enough of the right ones. In my years of research, I narrowed down the overwhelming and seemingly never-ending list of supplements to the true essentials: these are the products that will help your body manufacture the correct hormones and help these chemical messengers communicate in a way that’s maximally efficient and effective. While every woman should be supplementing with B vitamins, if you’re suffering from endocrine dysfunction, you’ll need to be extra aware of your intake. Research has shown that an intake of vitamins like thiamine (B1) is inversely related to endometriosis. Another important type of B vitamin, folic acid, is known to be an important weapon in fighting PCOS. Magnesium is a must for women with PCOS since it improves insulin sensitivity, a major PCOS issue. And if you’ve ever suffered from hot flashes — whether you’re menopausal or not even close — magnesium has been shown to significantly reduce the symptoms. If you’re suffering with fibroids, vitamin D is an absolute must. A study funded by the National Institutes of Health found that supplementing with vitamin D reduced the size of uterine fibroids. This may be especially essential for African American women since they’re 3-4 times more likely to develop fibroids and 10 times more likely to be deficient in vitamin D than white women. Probiotics are a must: one study found that in just 12 weeks, probiotics stimulated natural killer cells and helped significantly reduced endometriosis pain. The truth is, your body contains infinite wisdom. It knows how to balance your hormones. Whatever endocrine disruption you’re experiencing is due to the fact that you’re depleted in a specific area or areas and your body needs to be replenished; you have the natural potential for optimal hormonal function; your body has just lost its way and needs some re-direction and guidance. 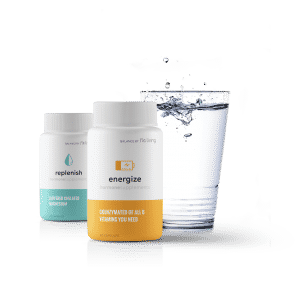 The supplements in my essentials kit are designed to support and enhance the significant improvements that will result from a targeted nutritional protocol. 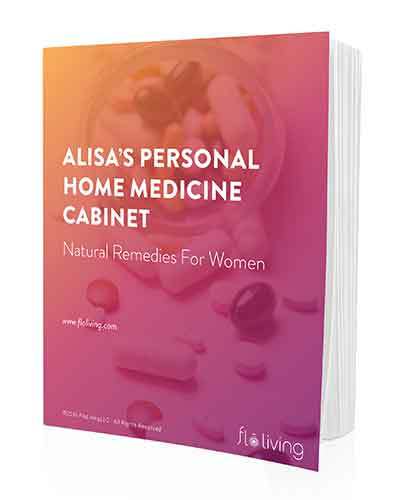 Whether you have a thyroid condition, endometriosis, PCOS like me, or intolerable PMS that your doctor won’t take seriously, supplementing correctly will speed your body’s ability to create real and lasting balance. 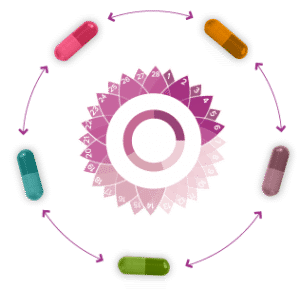 Whether you’re trying to get rid of pesky PMS, offset the effects of synthetic birth control hormones, improve a diagnosed condition like PCOS, Fibroids, etc, or improve your fertility, Balance Supplements are an excellent addition for healthier hormones. And in case you missed it, check out my most popular FaceBook Live to date from this past Thursday! I really dive into why these supplements are the absolute most essential micro-nutrients that you need to support your hormones. Listen Here.